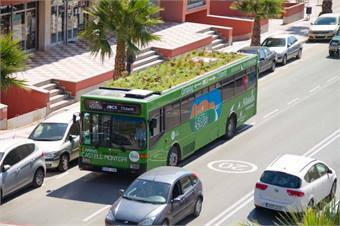 GIRONA, Spain — A green garden concept developed by a landscape artist is growing on the roof of a bus servicing the Spanish city of Girona. The greenery is planted in a lightweight hydroponic foam can be watered naturally or by the bus' air-conditioning system, according to Urban Gardens. For the full story, click here. RELATED: "Philadelphia installs green roof on shelter to manage storm water."